Joy Creek Photo Archive (c) all rights reserved While the flowers of Clematis 'Freda' (Deacon) are not as large as on some montana forms, but they are very intensely colored, showing off nicely against the bronze young foliage. A Great Plant Picks selection. All of our Clematis are two year old plants that are suitable for immediate planting in your garden. Late spring to early summer. 20-30 ft. 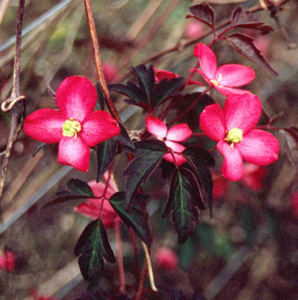 These vigorous, tall vines have lovely rugged foliage and produce masses of flowers in spring. Because they bloom on the previous year's growth, they should not be hard pruned. Cut back or tidy up after bloom.